(NaturalNews) Is modern life making people sick? While many people have theorized that the way we lead our lives today is nothing short of unnatural, recent research indicates that we may indeed be making ourselves sicker and more prone to disease as time marches on. Experts are even warning of an upcoming cancer epidemic. In the United Kingdom, studies show childhood cancer rates have increased by 40 percent in just a mere 16 years, and modern lifestyles are likely to blame. The researchers at the charity, Children with Cancer UK, analyzed government statistics to better understand the effect modern life is having on cancer incidence. It's been reported that nowadays, UK children spend more time indoors than US prison inmates; they're choosing to stay inside and play video games or toy with their smart phones and other such devices, rather than play outside. The Professor of Human Radiation Effects at Bristol University, and the scientific adviser for Children with Cancer UK, Dr. Denis Henshaw, commented, "When you look at cancers such as childhood leukemia there is no doubt that environmental factors are playing a big role. We were shocked to see the figures, and it's modern lifestyle I'm afraid." Over 4,000 children are diagnosed with cancer each year across the United Kingdom. In children between ages 1 and 14, cancer has become the leading cause of death. While experts say that population growth can be attributed to the 40 percent increase in total childhood cancers, there are other grim statistics that cannot be ignored. For instance, cancer incidence per 100,000 children has still increased by 30 percent in the same time period. So while population increases can increase the number of people with a disease, the per 100,000 rate shows that something else must also be at play because disease frequency is also increasing. 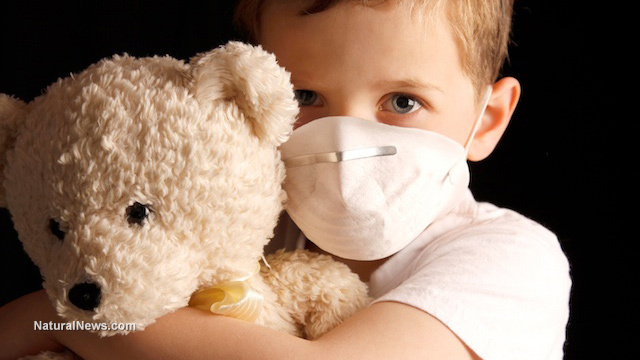 Dr. Henshaw believes that air pollution could be one of the primary instigators leading the rise in childhood cancers, but that other aspects of modern life likely also play a role. It's estimated that air pollution accounts for 40 percent of the increase. The Telegraph reports that many other elements could be increasing childhood cancer incidence, such as obesity, pesticides, other solvents, radiation, bright light at night disrupting circadian rhythm, smoking during and after pregnancy, magnetic fields from power lines, gadgets and possibly also the radiation from cell phones. "What's worrying is it is very hard to avoid a lot of these things. How can you avoid air pollution? It sometimes feels like we are fighting a losing battle," said Dr. Henshaw. He also commented that many of things are known to be toxic and recognized as being carcinogenic. However, their presence in society has yet to decrease. According to the Telegraph, colon cancer diagnoses among children and young people have risen by 200 percent since 1998, and thyroid cancer incidence has doubled. Cases of ovarian and cervical cancers have also become more common; their frequency has increased by 70 percent and 50 percent respectively. Children with Cancer UK estimates that the rise in childhood cancer costs the NHS an additional £130 million yearly. Scientists are urging parents-to-be to avoid oil-based paints in baby rooms and other areas where the child will spend time, and for pregnant women to avoid them as well. Expecting mothers are also advised to stay away from processed meats, pesticides and other potentially harmful solvents. Avoiding excess blue light and nightshift work during pregnancy is also suggested. Prevention is truly the most important aspect of childhood cancer. As Kate Lee, chief executive of children's cancer charity CLIC Sargent notes, even though about 80 percent of childhood cancer survivors are now surviving for at least 5 years, "[T]he aggressive treatments they have as children can have a major impact on their future health, even if they survive."